October 11, 2018 (LifeSiteNews) – One of the benefits of writing regularly on the internet is that I receive a fair number of notes from readers with whom something I’ve published has struck a chord. I hear disproportionately from priests, religious, and seminarians who are struggling to live a faithful Catholic life—above all, liturgically—in the midst of a hostile wasteland, with wolves on one side and hyenas on the other. Thank you so much for writing this article. It seems odd that this subject has received such little attention. I’ve not found anyone who thinks Pope Francis’ actions are problematic. Until now, I have always taught that despite some sinful popes and bishops, none has ever officially proclaimed an error to be truth. The teachings of the Magisterium cannot be “overturned” like an unconstitutional law. Teachings can be expanded or elaborated on to account for new developments or discoveries, but not reversed. To my knowledge, no encyclical with a declarative statement to establish, explain, and define the [new] teaching was issued. It’s simply inexplicable that an act is morally good/allowable for thousands of years, to become today an intrinsic evil. This event leads me to believe that Francis has no clue about the workings of the Magisterium or the Holy Spirit! One of my concerns is the damage this kind of thing does to my ability to teach moral truths. It’s essential for the faithful to have absolute confidence in the accuracy of the Church’s teachings. I fear similar errors will follow from the current Vatican in regard to teachings on marriage, human sexuality, and ordination. If a pope can simply bypass common sense, convention, and tradition to revise the Catechism, all moral teachings are questionable. This good priest is quite correct. The faithful deserve clear and consistent moral guidance that is not peppered with contradictions, ambiguities, doubts, and loopholes, otherwise they will turn away from the Church either to a secularism that has no rules except self-gratification or a sect that has strict (but not always correct) rules. For man cannot live without some principle to live by, and he will live either by true principles such as Christ has given us through His Church, or by false principles such as self-love, political messianism, or sectarian codes. The extent to which the Vatican appears to be operating by all three—the messianic complex of the great leader, the sectarian creed of liberal Protestantism, and the self-love that places modern differentness over traditional commonality—is therefore most appalling, and presents the single greatest challenge to pastoral care, Church renewal, and evangelization that the Church has yet seen in the post-Tridentine period. In responding to the priest, I expressed my agreement with his analysis. What the pope is doing is terribly destabilizing, not only for Catholic pastors today, but for the future work of all of his successors. The papacy has become far too politicized, as if each conclave is a new parliamentary session electing a new prime minister to run the country’s affairs in a liberal or conservative direction. This is certainly not the vision of the pope as the staunch guardian of doctrinal orthodoxy and the determined upholder of ecclesiastical traditions that Church history reveals to us at the papacy’s best moments, nor is it the theological vision of the papacy discussed at and taught by the First Vatican Council. Let us hope, for the sake of preserving the little sanity we have left, that Our Lord does not permit us to capsize into still murkier and rougher waters than those in which we are currently sailing. I return now to the issue raised by my correspondent. There is no question that the death penalty is permissible in some circumstances, and that is because the death penalty is taught by God to be, and is accepted by Catholic tradition as, a legitimate exercise of punitive and retributive justice on the part of the state, which has its authority from God, the Lord of life and death. One is allowed to argue that those circumstances no longer obtain, but one cannot say the thing in itself is evil. That, indeed, would be heresy, and one notes that Francis did not dare to say this explicitly in the new Catechism text. But he implies it, which is hardly less damaging, for all the reasons we have seen. 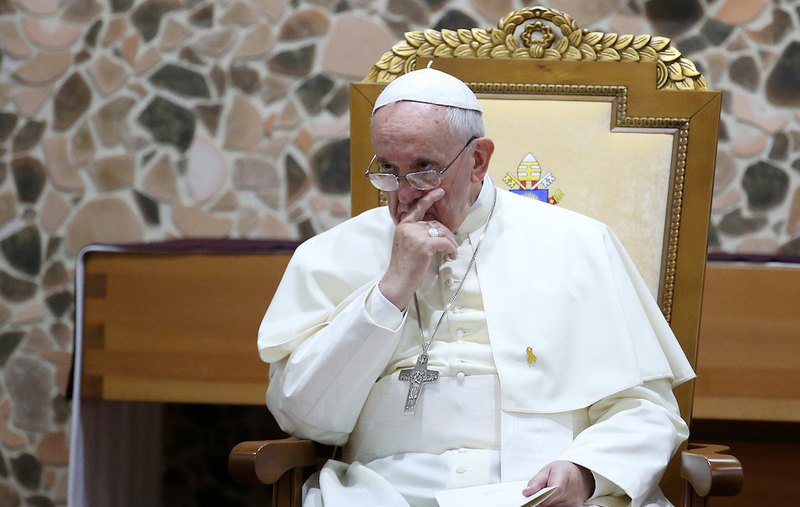 Are you a Catholic tempted to tear out your hair and say: “Wait a minute, if the pope can’t be trusted, who can?” There is a way out of this perplexing situation. It involves admitting forthrightly, as most Catholics in history would readily have done, that the pope is not above the law, not above tradition, not above the theological witness of the Fathers and Doctors, but in communion with them and, in a sense, subordinate to them. Therefore, one may always be confident believing and teaching what has been held “by everyone, always, and everywhere” prior to this time of confusion. Peter Kwasniewski holds a B.A. in Liberal Arts from Thomas Aquinas College in California and an M.A. and Ph.D. in Philosophy from The Catholic University of America in Washington, D.C. After teaching at the International Theological Institute in Austria and for the Franciscan University of Steubenville’s Austrian Program, he joined the founding team of Wyoming Catholic College in Lander, Wyoming, where he taught theology, philosophy, music, and art history, and directed the Choir and Schola. He now works as a freelance author, public speaker, editor, publisher, and composer. Dr. Kwasniewski has published five books: Wisdom’s Apprentice (CUA Press, 2007); On Love and Charity (CUA Press, 2008); Sacred Choral Works (Corpus Christi Watershed, 2014); Resurgent in the Midst of Crisis: Sacred Liturgy, the Traditional Latin Mass, and Renewal in the Church (Angelico Press, 2014); and most recently, Noble Beauty, Transcendent Holiness: Why the Modern Age Needs the Mass of Ages (Angelico Press, 2017). Resurgent in the Midst of Crisis has also been published in Czech, Polish, German, and Portuguese, and will soon appear in Spanish and Belarusian. Kwasniewski is a board member and scholar of The Aquinas Institute for the Study of Sacred Doctrine, which is publishing the Opera Omnia of the Angelic Doctor, a Fellow of the Albertus Magnus Center for Scholastic Studies, and a Senior Fellow of the St. Paul Center. He has published over 750 articles on Thomistic thought, sacramental and liturgical theology, the history and aesthetics of music, and the social doctrine of the Church. I am pretty sure the author would be aware that Pope John XXIII came right out and said that he would never make an ex cathedra declaration on anything. I forget his exact reason or if it was a general fear of the consequences of being wrong and the harm that would come to him or the Church through a false proclamation. To me a statement like that by Pope John shouldn’t be made by a pope. Especially one who convenes an ecumenical council! Small wonder it was termed a “pastoral” council. What is so ludicrous is that it is being touted by this papacy as almost the only relevant council and not strictly pastoral as it is referenced in attempts to alter doctrine.